Holi Festival, also known as the “Festival of Colours”, will be held at the Indian Cultural Center, 63 Tran Hung Dao Street, Hoan Kiem District, Hanoi on March 30. The Holi Festival, organized by Embassy of India in Hanoi. Holi is the Festival of Colors which is the time of fun and frolic, eating and celebrating together the different colors of life. It also celebrates the victory of good over evil, the arrival of spring and the end of winter. Meanwhile, the Holi Festival will be organized by Incham Hanoi will be held in Hanoi’s Kinder Park on April 1. The “Festival of Colours” will be held from 11am to 2.30pm with lots of fun, joy and organic colours. Kinder Park is at 614 Lac Long Quan road, Tay Ho district. Food, drinks, henna, face painting and entertainment will be included. Last year, Holi Festival took place at Kinder Park in Hanoi on March 19, attracting thousands of participants. 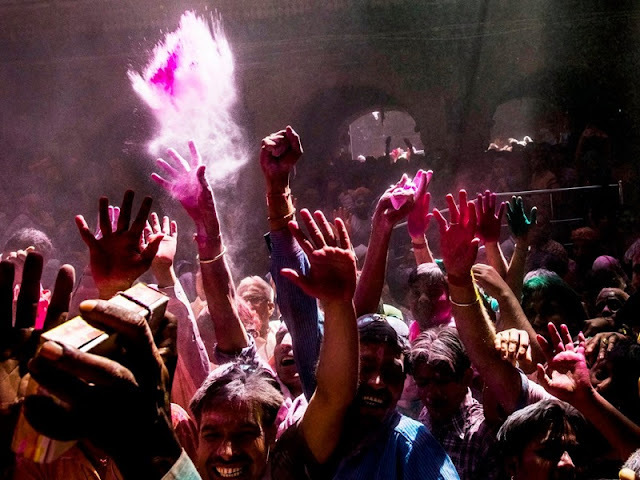 The festival is famous for paint-throwing revellers showering each other with colour, representing a tradition that is both meant to reflect the rainbow of colours of springtime and the playfulness of the Hindu God Vishnu. People take part in Holi all around the world, but it is celebrated the most in parts of India and Nepal. It is often associated with the coloured powders that end up coating its participants after they’ve thrown them at each other. But this is just one part of Holi, which is split into two events: Holika Dahan and Rangwali Holi. Are you in Hanoi? If so, do not miss the opportunity to experience this exciting festival in the capital of Vietnam.